Posted on April 27, 2017 . 23 Comments. Mastery of the one-arm (OA) or one-arm one-leg push-up (OAOL) push-up is a process that will teach you many things about your body while providing surprising strength gains that will carry over to many other skills as well as other modalities. One of the best parts about adding this bodyweight skill to your training is that it can be performed anywhere. The pursuit of the OA/OAOL push-up can be done as a stand-alone program or added to your pulling and/or lower-body program. And you will be amazed with the “what the heck” effect you experience when you return to training other skills. You will find that you have either maintained the strength from these old skills or, in many cases, you will achieve new personal records on lifts without having worked on them. 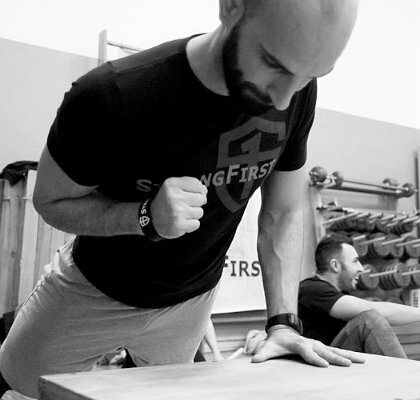 When you begin working bodyweight skills, especially the OA/OAOL push-up, the tension required can zap your energy and this is normally a shock to those attending the SFB Certification. Bodyweight training is more neurologically fatiguing and requires longer rest than other types of training. Due to this fatigue factor, we recommend no other pressing training if you are serious about obtaining the OA or OAOL push-up. For beginners, I recommend following the three times per week program outlined below to see how your body feels and rest on the off days. After a few weeks, add the grease-the-groove days once your body has adjusted to this type of full-body tension training. I recommend performing this program at the beginning of your training session while you are fresh and able to generate the tension required for proper form. Your body only has so much neural drive and once you deplete it, then your form will begin to fail. We want a higher volume of quality movement versus building a larger quantity of less-than-stellar technique. Below we will discuss the most common compensations that we see that lead to loss of tension. To meet the StrongFirst testing standards, you need to maintain full body tension and move your body as one unit. The student will assume the one-arm plank and lower his or her torso under control on one arm until the tip of the elbow of the working arm is above the top of the shoulder, then he or she will press back up. The feet must not be wider than two shoulder widths’ apart. The side of the feet may not touch the deck at any time. The body must be motionless for one second before and after the push-up to demonstrate control. The shoulders must stay parallel or almost parallel to the deck for the duration of the movement. There must be a distinct pause at the bottom of the push-up. The hips and the shoulders must descend and ascend at the same rate. The foot of the free leg may not touch the ground during the duration. The shoulders must stay parallel or almost parallel to the deck for the duration. Irradiation: “Squeezing energy” out of different muscles and channeling it to the prime movers. Feed-forward tension: The ability to tense muscles maximally without external load. Dominanta: Generating tension, but focusing on lifting. For a thorough understanding of these principles, we recommend you attend one of our SFB Courses or Certifications. Due to the tension required with training to our push-up standards, you will need to counter this contraction with stretching and relaxation. Cobra stretch and Fast and Loose drills are recommended to be inserted between all sets of exercises that demand intense abdominal contractions. High repetitions of these push-ups are not advisable, as they excessively fatigue the stabilizers such as the quadratus lumborum (QL). We recommend you stretch your QL at the end of each OA/OAOL push-up session. Each of these compensations demonstrates a loss of tension. Make sure to video yourself so you can check for these compensations, or have a training partner stop you if he or she sees any of these. If compensations are occurring, take a regression (higher elevation) until you have plugged the holes with tension, then resume progressing accordingly. Test your max to set a baseline before training for this goal. Test the lowest elevation possible with solid technique. 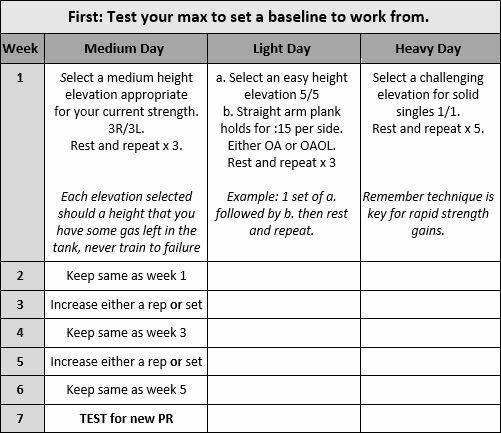 If your max is a OA on the ground and you want to work to a OAOL, then test your OAOL max elevation. If your max is a two-handed push-up, then test your OA max elevation (even if that means at the wall). If you find you are very unstable when you remove an arm, begin with plank holds to build a solid foundation of shoulder stability before to moving on. Plug your max into the program below. 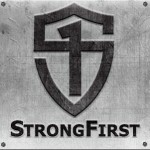 If you are still unsure of where you should begin, send a video to karen.smith@strongfirst.com. Track your progress over the six weeks and then retest during week seven after you’ve taken two to three rest days. Post your progress to the StrongFirst BW forum. This program can be repeated for several cycles until you reach your goal. Just remember when the OA/OAOL push-up is your main focus, you should be doing no other pressing. You can continue any pulling exercises. If your schedule only allows you to grease the groove (GTG), you will still be able to obtain strength gains. Taking a GTG approach to this movement means you should be greasing-the-groove throughout the day with a progression that is about 50% of your max for singles. Stay fresh and stop before your form fails. As you progress through the program and your body becomes more used to the neural drive required for this high-tension skill, you can add GTG training on the off days between this program. A great GTG progression is the planche progression, in which you use your opposite hand for assistance while loading the working side more and over time unload the assistance. How much rest period is recommended between arms and sets? After completing reps on my right arm, I usually need a rest before I can start on my left arm – is that rest ok? The rest will really vary from person to person. Learn to read your body and give it what it needs to perform all reps/sets with proper form. If we rush back to quickly to the next set or rep or side, we can set in bad habit. Thank you for correcting these mistakes! lower back* and upper too.. I am currently at week #3 of the program and I am doing great. However, I was wondering to include some (daily or so) crawling sessions of about 10-15 minutes. I perform the OS Resets daily, and reading the articles of Geoff and Tim I found that, according to their experience, crawl help in achieving the OAOLPU. I trust Tim and Geoff, but I would also know the thoughts of the Chief SFB. Thanks for sharing this program and looking forward to hear from you! PS – Close to the Texas population after hurricane from Italy. Crawling is fine as long as it isn’t so much that you have fatigued yourself. I personal did not do any crawling in order to achieve my OA, but know that some have used that method. Would the Turkish Get Ups from Simple and Sinister be too much of a press and conflict with this program? Doubtful, Riley. Go for it! 1. can I use this plan along with standard S&S kettlebell routine? if so, can you be a little specific on how to combine both? 2. do you have any such plan for Pistols as well? can it also be used with S&S? You can do OAPU program and then proceed with your S&S. 4. Finisher if needed at the end. Thank you very much for the reply. Can’t wait to see your 6 week pistol training plan as well. I will send you an email for the details. Totally up my alley! Because S&S doesn’t have a real press in it (well, a kind of floor press, but it’s not much of one) I adopted the Naked Warrior pushups into my training long ago. I have no problem doing 5/5 one arm pushups. I am challenged though with achieving perfect one arm one leg pushups. I’m also not sure if when I get good at one arm one leg pushups I am supposed to do 5/5 with them too, or should I be alternating left and right sides of one rep. If you get a solid OAOLPU then yes you can proceed to 5/5 if it fits your goals. Can i mix this program with S&S (simple goal) and could you provide any recommendations how to do that? Yes 🙂 Seems that is the most asked question at the moment. It can be done with S&S, I would do it first at the pure strength goal then proceed with your your S&S. however other may tell you to do your S&S first and then proceed with the OAPU work, it really depends on your goals and the priority you place on one over the other. Just what I needed in collaboration with the book *Naked Warrior*. I currently have a 6 week pistol program running. Email me if you are interested in that. You mentioned that pulling movements were ok to keep doing. What about squatting movements? Could I continue doing double KB front squats? Maybe on off days? You squatting is fine to continue. Great program! Are the Light and Heavy days for weeks 2-6 programmed the same as the first week? Meaning: Is the Medium day the only one that increases either by a rep or a set in weeks 3 & 5? All days increase -sorry for the confusion, as I probably should have typed it in each column. Example: Week 3 – increase by a rep or set on each of the three training days. As these elevations become easy, you can lower to a new elevation over time. Just make sure you do not rush too quickly or you could set in bad habits.